Wintertime is the time for fun little projects. Of course, throughout the year we do have lots of Life Admin to get through (we call it “And We Also Have To…”) which can be so draining. The moment you’ve washed all the towels, you realise you have to now wash all the bedclothes and then sort through your papers and call up your utilities provider to find out why exactly they have charged you for a service you don’t need. So in the winter – when it’s pouring and it’s safer to stay in – we also make time to crank up some songs from musicals and do fun but time-consuming things like experimenting with Martha Stewart gift wrapping ideas (in time for Xmas), knitting the long(est) scarf (in the world, end date TBC), dyeing all of our bathmats a different colour (sounds lame but we love new colour schemes), swapping clothes (it’s a twin thing) and cooking something that will take forever but eaten in minutes. We don’t know about you, but we often come across things on the internet and think “Oh I want to try that” and we don’t get round to it until the the leaves turn golden brown and we’ve finally turned the heating on. This week, we opened up our Essential Delhi Cookbook and decided to make Nargisi Kofta – something we wouldn’t normally make at home and expect to find at a fancy restaurant. 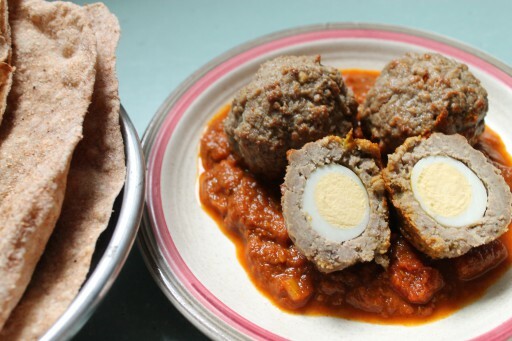 The dish is essentially Indian Scotch eggs – hard-boiled eggs wrapped up in spiced minced lamb and then served with a curried gravy. No-one is really sure whether it came from England to India or was developed in India first but what we do know for sure is that it is DELICIOUS. And super high protein. The book says that Nargisi Kofta gets its name from the yellow and white of the egg which is supposed to resemble the Narcissus flower (Nargis) or as we know it, the daffodil. 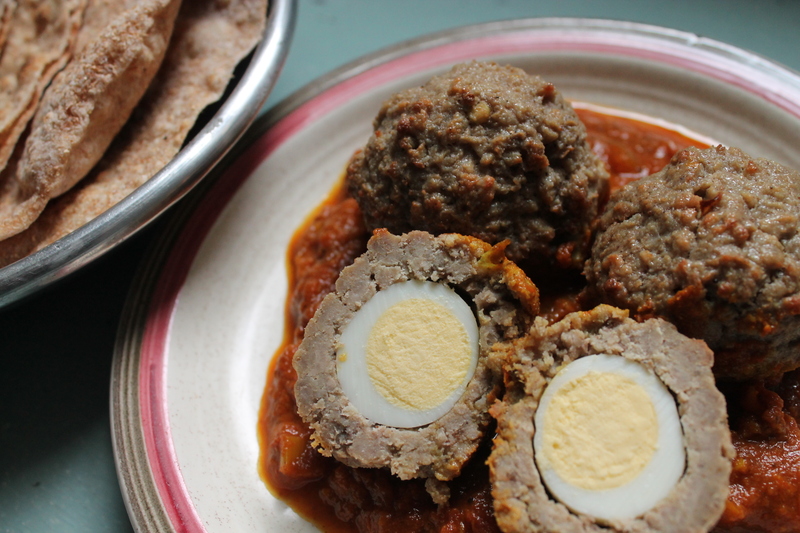 We made only one amendment – we used quail eggs instead of chicken eggs because 1) we’ve always wanted to make something with quail eggs and 2) this way you get to eat more koftas! In a saucepan, melt the butter. Add the cumin and fry for 30 seconds. Add the onion and cook on medium-heat until golden. Add the garlic, ginger, turmeric, coriander seed powder and cook for 1-2 minutes. Stir frequently so that it doesn’t burn. Add the tomatoes, water, red chillis and garam masala and cook for 7-10 minutes until the oil separates from the mixture and the mixture is paste-like. Then set aside the pan to cool. We transferred the mixture to a plastic bowl to help with the cooling process. Preheat the oven to 200C (fan-assisted). Add the gram flour – a tablespoon at a time until it comes together. Add the garam masala and beaten egg and mix thoroughly. Divide the mixture into 12 equally-sized patties. Brush each hard-boiled quail’s egg with water. Place each one in the centre of a patty and the work the mince around to enclose the egg completely. Make sure there are no cracks. Place the kofte on a baking sheet lined with foil and thoroughly greased with oil. Bake for 15 minutes until the kofte are browned. Serve on a bed of gravy (you may want to warm it up if it is cold) with rice or chapattis.